Ideas + Great Web Services = New Fun Site. Introducing Crocspotting.com! I love the internet. There are SO many cool tools, services, and ways to network and connect with people that it makes the whole process of turning an idea into reality almost effortless. For example, a couple of months ago, Scott Kveton wrote a blog post about how cool it would be to have a way to aggregate all of the cool Portland people on Twitter in one place (and yes, he worked a bacon reference in there). He even registered a domain name for the idea – pulseofpdx.com. I thought it would be cool, too, so I started tinkering around with Twitter and Tumblr, and within a couple of hours, we had it up and running. Since then, smarter and more talented people than I have taken it much further – Michael Richardson coded up a better solution, Jessica Beck gave it a swanky design, and the idea even snowballed into other projects (PulseofOpenSource.com, and eventually, the award winning mashup site TweetPeek.com, which launched at SXSW 2008). Yesterday, another one of those cool “perfect storms” of ideas, easy to use web tools and services, and smart, innovative people happened. It all started with some photos I posted of a recent trip to the beach, of me in my signature orange Crocs. A conversation on the topic started up on Twitter. I pointed out that I always wear orange Crocs – they’re my “trademark”, my RSS Evangelism Shoes. Something remarkable about me – I’m “the guy with orange Crocs”. @verso chimed in that she’d love to see “orange Crocs Around the World” – sort of like the traveling gnome meme. i thought it was a cool idea, but knew I probably wouldn’t have time for yet another fun little side web project. Kelly (@verso) even came up with some name ideas – crocsvacation, crocsightings, crocspotting. So, I started playing around. I’ve been using a very cool tumblog service called soup.io for my lifestream (www.joshbancroft.com) and linkblog (linkblog.joshbancroft.com). I knew the site would have to update itself automatically if it were going to work – I don’t have time to manually update something like that – and soup.io makes a great aggregator/foundation for that piece. You can map a custom domain name to a soup.io stream, so I had @jcjdoss do a little DNS CNAME magic. Then I started messing around with RSS feeds for tags on Flickr, to find the actual pictures of Crocs. I ran into some frustration with the fact that some people tag things that really aren’t what they say. I tried a couple ways around the problem of pictures of crocodiles appearing in the results – Flickr search will let you exclude keywords, but you can’t get an RSS feed of search results, so that was out. I played around with Yahoo Pipes to filter out the unwanted pictures, and that worked beautifully, but it broke some apparent magic that soup.io uses to display large versions of pictures from Flickr, instead of the very small thumbnails that appear in the feed. So, using Yahoo Pipes, filtering worked, but the pictures were too small. In the end, I stumbled upon an elegant feature of soup.io that solved the problem – you can delete items after they’ve been imported from an RSS feed. So I just removed the off-topic pictures. ViolÃ¡! Want to participate? 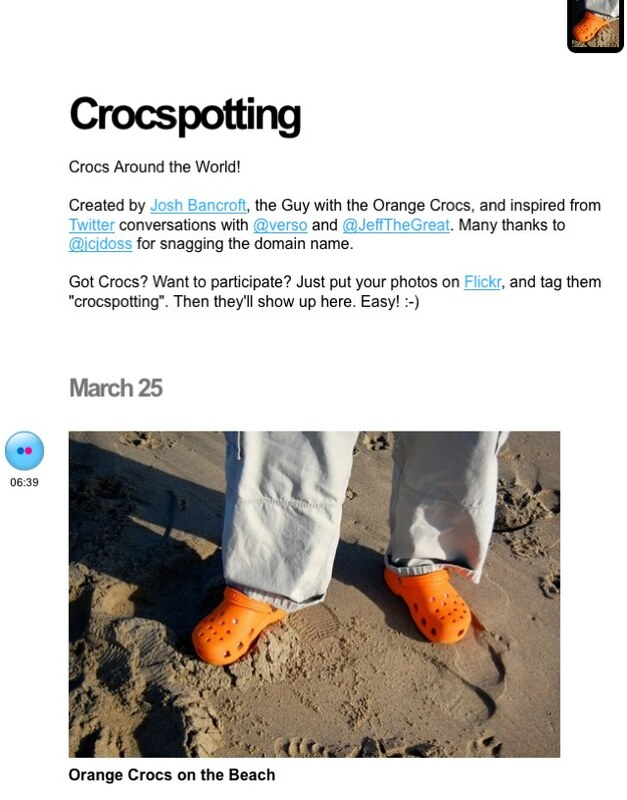 Upload your Crocspotting photos to Flickr, and tag them “crocspotting“. That’s it. They’ll show up on the site. Want to get updates when new Crocs are spotted? Subscribe to the Crocspotting RSS feed. The point is that it was fun, and it was easy, and it was fast. It all happened using free web services (except for the domain name cost – thanks @jcjdoss!). It went from the first inklings of an idea to a reality inside a couple of hours. So, if you don’t care about Crocs, think about your own wild, crazy, idea, and how to make it happen. Use your network of friends and smart people (you DO cultivate a network of friends and smart people, don’t you? 😉 ) to help fill in the blanks, and help out, and who knows? Take something you like, mash it up, play with it, tweak it, turn it around, and see what happens. You might be able to make something cool, fun, and remarkable that you never thought possible. You are an odd, but interesting duck sir. If I had 1/100th of your internet savvy I’d be perfectly content. YAY! I am so glad I was able to help make this a reality! It’s fun to enable people to do goofy neato side things. Ha! Great little site; fun, no ambitions, just cool. But like @turoczy said, AdSense and Amazon Associates, tonight! Now, how to get the Crocs folks to sit up and take notice directly….. you’ve got something that will grow quickly. Hopefully they don’t sue. I have heard that they sent a cease and desist letter to a fan site. That being said, I shall tag all my Crocs. And Josh, I bet I have more Crocs than you. I even have the yummy Batali version.